imperfect moments of everyday life. Capturing these moments is what inspires us to take photographs. Together, we are lifestyle photographers with a natural, soft & romantic style who would be delighted to help tell & preserve your unique story. When not taking photos, we find inspiration by spending time by the sea, thunderstorms, the poetry of Pablo Neruda & the artwork of Marc Chagall. Walks in the forest, enjoying a glass of wine & reading a good book remind us that it is the simple things in life that matter, there is nothing bigger is there? Salvatore & I met when my friend and I were on vacation in Italy and driving the perilous Amalfi Coast. An incident with a bus left us trapped with a flat tire in a tiny town I had never even heard of (Praiano), right in front of the hotel where Salvatore was working at the time. The way two people are brought together in this world is a thing of both chance & beauty. 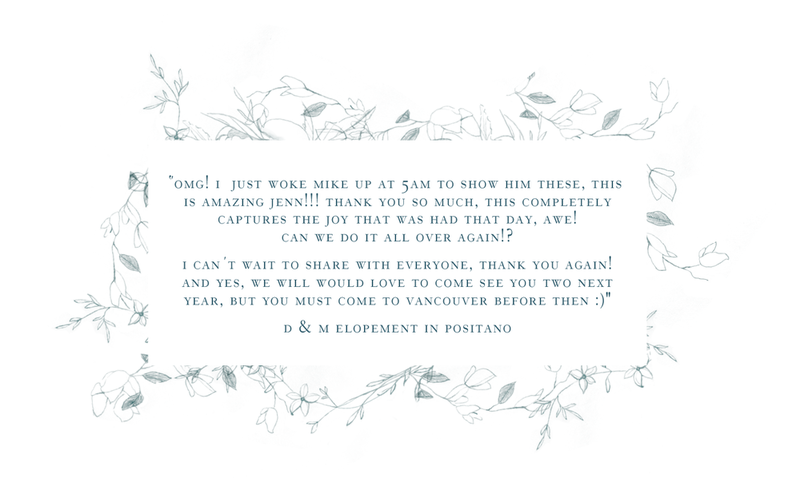 We always love to hear how all of our couples met, and find such joy and serendipity in every single story. I still remember at the time that flat tire seemed like the end of the world, such a small thing, but without it our paths never would have crossed. Being that we grew up in different parts of the world we wanted our name to reflect both the english and italian language. We have always loved the delicate and intricate nature of lace and hope our photographs reflect these qualities. We are forever inspired by light and shadow, and how the two play together to create gorgeous images. Luce is the italian word for light & we wanted our name to illustrate our luminous imagery.